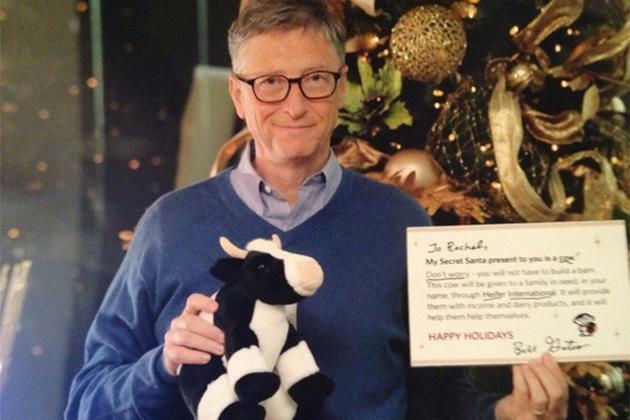 What if Bill Gates was your Secret Santa? A Reddit user named Rachel got a huge surprise this week when she learned that the "Bill" who was her Secret Santa in the site's annual gift exchange is actually Microsoft co-founder Bill Gates. Rachel didn’t realize right away that the package of presents appeared to have come from the billionaire philanthropist, whose office confirmed his participation in the gift exchange to Yahoo News. "I thought Bill sounded like a friendly fellow,” Rachel wrote in a Reddit post. “In fact, I had this whole image of this poor guy named Bill trying to navigate my wishlist full of makeup, nailpolish, glittery things to buy me. Quite frankly I felt bad for this ‘Bill.'" But then she dug in a little deeper. "I opened this and it’s a man holding a sign … And then it finally hit me. All the presents I just tore open, the charity, then everything — was from Bill GATES." So what did Rachel get? Well, not just a stuffed cow. A stuffed cow, along with a donation in her honor of a real cow to a family in need via the charitable group Heifer International. And a really nice travel book. The gifts were, to say the least, a hit with Rachel, as she made clear in a thank-you to Gates. There was one item Rachel requested, however, that was not delivered. "Sorry for the apple ipad on my wishlist, that was really awkward."